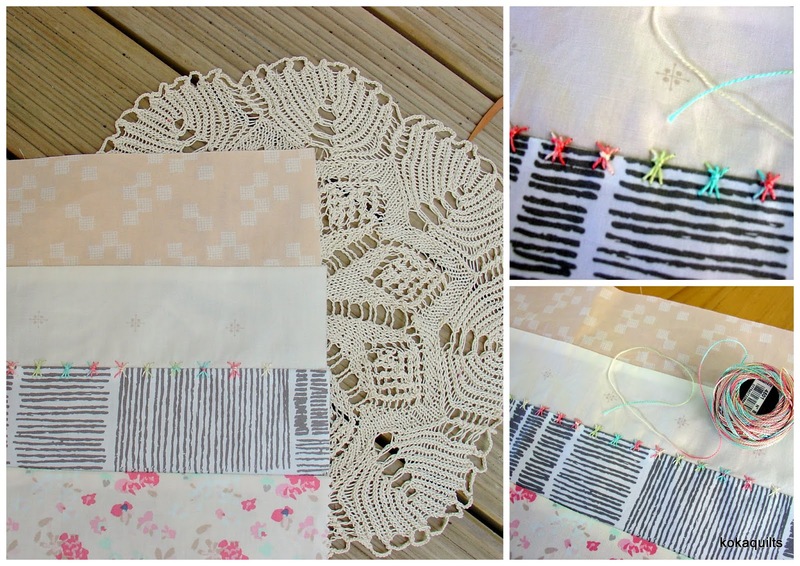 I have been making steady progress with my *'boho patchwork' quilt and am enjoying seeing how this restful pale palette develops. This quilt project is part of my 'using up the stash' mission, and I'm using a few different Art Gallery fabrics and other favourites that I've collected over the past year. It's great how they all mix up together beautifully along with my assorted low volume fabrics. Still trying to master the embroidery, it's a new thing for me. I'm doing lots of french knots, free form daisies and simple back stitch. The latest pattern is a traditional one but reworked into fresh & new fabrics. There are 10 'mod tulip' blocks, only nine more to make. 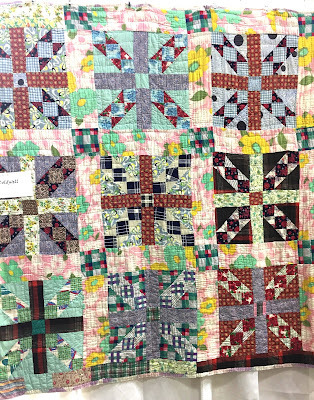 *Anthologie Quilt is a sampler quiltalong happening over here at barijquiltalong and here at SouthernCharmQuilts with Melanie. Loving the idea of adding lots of lovely extra touches like collage, crochet lace and sashiko, giving it a little boho flair. And check out these wonderful IG links too (thanx Julie!) 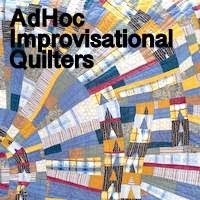 for more textile art ideas - bohosal bearsville50 #textilecollage #rawedgeapplique. Wishing you all a very . . .
sipping tea and pondering my next steps. I had two WiP's that needed to be moved along . . . before we rolled over into next year. 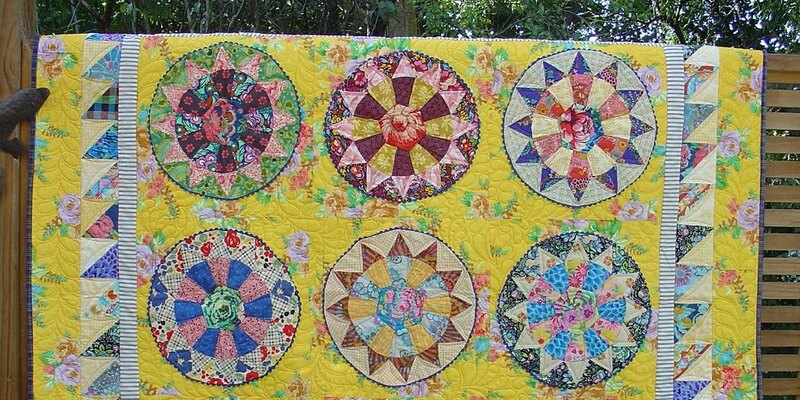 I've used some of those lovely barkcloth Outback Wife fabrics in both of these quilts, loving the vintage vibe of the floral prints. I loved reading the design stories about these fabrics too, like this one here about Elaine - follow the link to check out more. 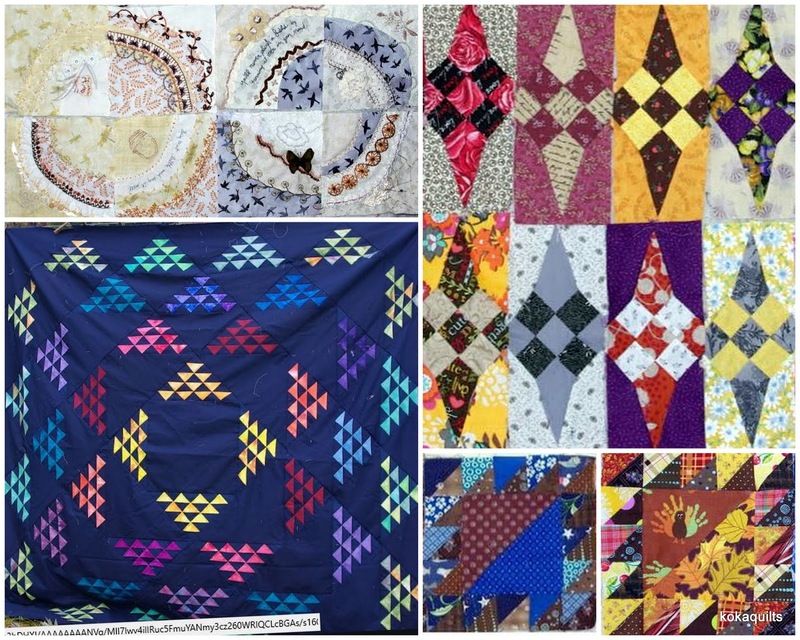 And, pop over here to redpepperquilts to read all about the latest collection. My 'zigzag' quilt top started out with a hiss & a roar, then I got stuck . . . I wasn't happy with how it was going, maybe the dark border wasn't helping? Anyway, it ended up sitting in the unfinished pile for a few months. So today I pulled out all my leftover fabrics, made up quite a few more blocks while I thought about what to use for the borders. I did have a large piece of blue/green fabric, Outback Wife 'Kirstene' which I had been going to use for some fussy cutting, and it ended up being just right. After a bit of auditioning & extra sewing time I'm much happier now. using mainly the same fabrics, was a much easier fix yesterday though. After I'd pieced my blocks it still didn't seem big enough, so I simply cut lengths of scrappy leftover light background fabrics into nice 4 1/2" wide borders and stitched them on. Done! Don't know why I left it so long! And now both quilt tops are all ready for basting & quilting. to my floral collage blocks . . .
with a simple backstitch and some pretty varigated perle cotton . . .
Branching out a bit more with a line of sheaf stitches, great for stitching over a seam . . .
- and Nichole's IG feed is full of lots of ideas I'm tempted to try too. This week we are making three 'granny square' blocks . . . I've also been adding some extra embroidery details to my floral collage blocks . . .
if you want to see what everyone else is doing. I made one more 'whimsy' block . . .
two more 'handkerchief corner' blocks . . .
plotting my next WiP, using allout exciting colour teamed up with shadowy earthy fabrics. . . 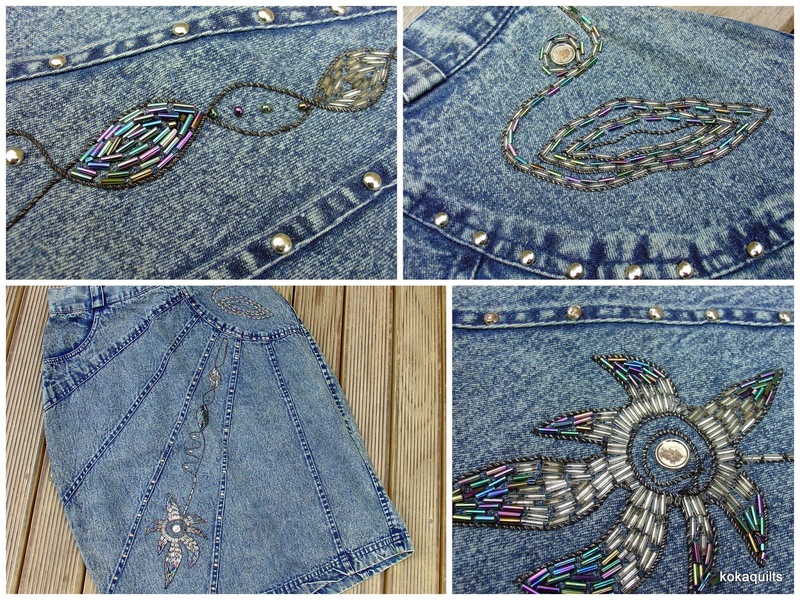 I came across this old denim skirt, which I do remember wearing a long time ago! Oh dear, see just how easy it is to jump from one thing to another. She's made 25 of these wonderful scrappy blocks . . .
Cathy loves working on a variety of projects too, inspiring the rest of us! 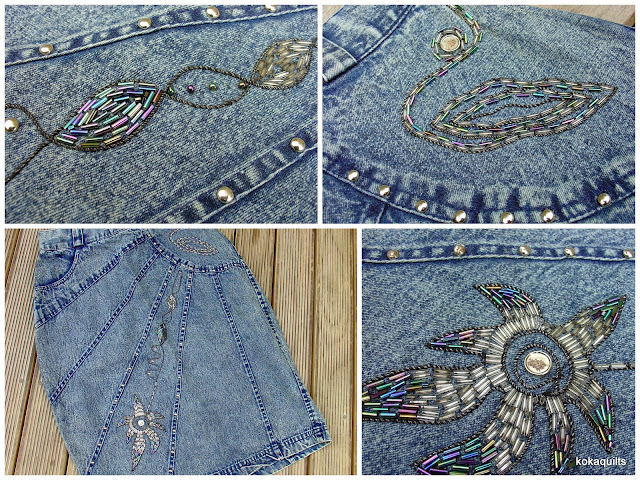 Here's a little peep at a few other scrappy WiPs she has on the go . . . 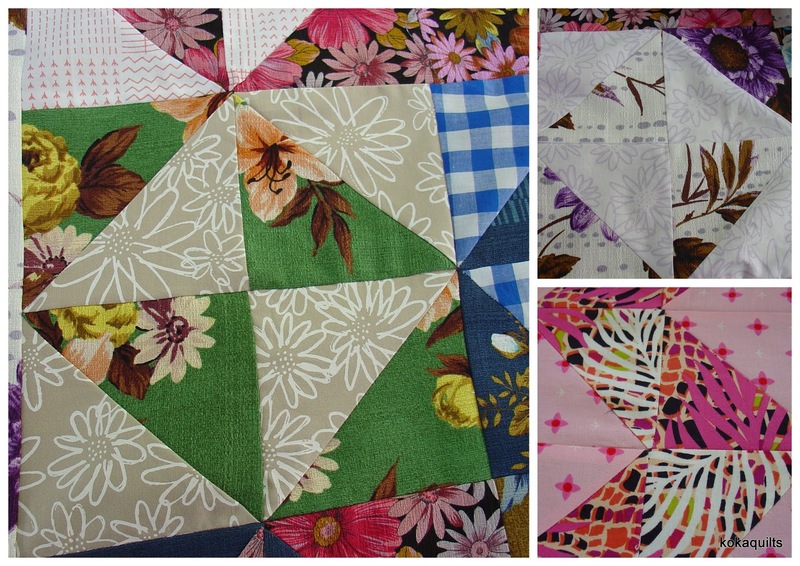 Pop on over to her blog here to see heaps more pics and read all about her quilty stories. Do you have a project to share this week too? 1. Link up any post from the past week that features something you have been sewing or stitching, whether they are WiPs, starts or finishes. You can write as much or as little about your project as you like, and snap off a pic or three. 2. Somewhere in your post, please link back to this post. 3. Please comment on a couple of the other Sew, Stitch, Snap, SHARE links. We will be back again Wednesday 7 February 2018.